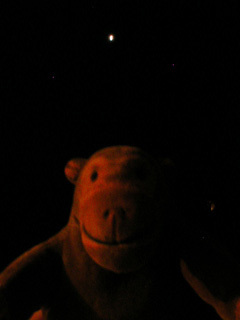 On the night of March 3rd, 2007, someone told Mr Monkey that the moon was about to be eclipsed. Mr Monkey thought he'd better have a look outside to see what was happening. Mr Monkey scampered out into the back garden, where he was pleased to find that there weren't any clouds between him and the moon and that the moon was conveniently positioned. 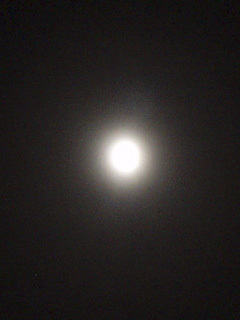 He also noticed that something had taken a bite out of the bottom of the moon. Mr Monkey stayed out watching the shadow of the earth crawling up the face of the moon for a while, then his humans started complaining about the cold and he went back inside. 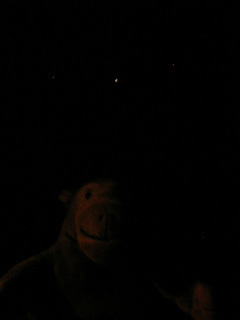 At about twenty past ten, Mr Monkey went outside again and noticed that the moon was definitely getting smaller. He went to look at the moon again around eleven, and found that there were a lot of clouds annoyingly drifting between him and the moon, so he no idea what was happening. 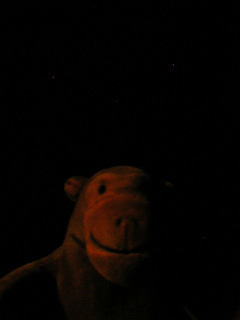 Mr Monkey went back out again several times, and at half past eleven found that the clouds had gone and that the moon was in view again. 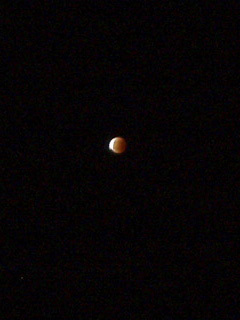 By now it was wholly in the shadow of the earth and had gone a coppery red colour. 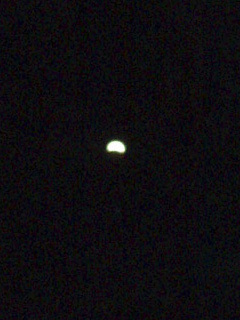 This was because the only light getting to the moon was some that was bent inwards as it passed through the earth's atmosphere. 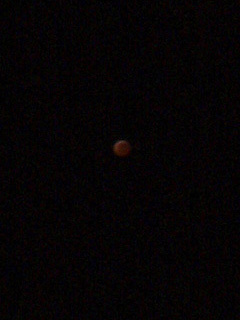 All the blue elements of the light were filtered out too, so the moon was an odd reddish colour. There's an explanation of what was happening at the Mr Eclipse website which is quite helpful. 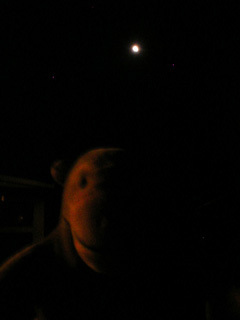 Just after midnight Mr Monkey saw that the moon was starting to leave the umbra behind the earth. While most of the moon was still red, there was a sliver catching direct sunlight. 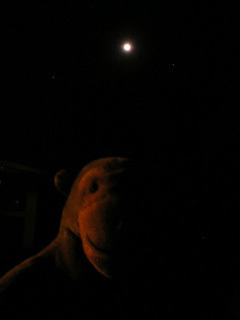 Around half past midnight Mr Monkey looked out again to see that most of the moon had left the umbra and was properly lit up. 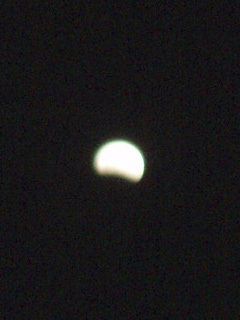 There was still a little bit of shadow at one side, though. 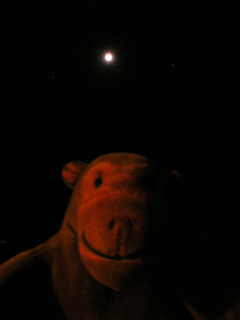 Mr Monkey went out for a last look at the moon around ten past one, to check that the eclipse was over. And it was. 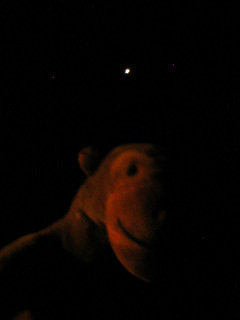 Mr Monkey thought that the moon looked brighter than it had before, but he was fairly sure that an eclipse doesn't actually clean the moon.